Come Explore Key West, Florida with us! Our Miami to Key West bus tours are the ultimate way to experience the awe-inspiring beauty and amazing engineering of the southernmost section of historic US Highway 1, the road famously known as the Overseas Highway. Spanning the entire 2,369 miles of the East Coast of the United States, Highway 1 is America’s longest north-south road, and the 127-mile stretch that threads the blue waters and lush tropical landscapes of the Florida Keys is certainly among the country’s most scenic routes. America’s southernmost US Highway begins with mile post zero at 490 Whitehead Street in the heart of Old Town Key West and runs north to Miami. 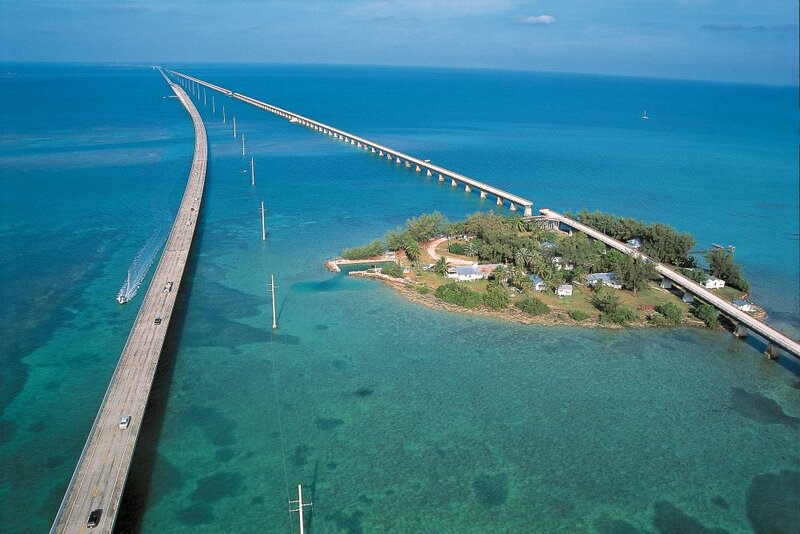 Along the way, the road traverses a number of the Keys both inhabited and uninhabited and crosses open water at many points including the amazing Seven Mile Bridge. A road trip through the Keys on the Overseas Highway is a unique and wonderful experience, definitely one for the bucket list, and our Miami to Key West bus tours are the only way to go if you really want to relax and take in the sights in style. Our luxury coaches surround you with comfort and convenience, and with an experienced professional driver at the wheel, they are absolutely the safest, easiest way to add a Key West side-trip to your Miami visit. You can gaze at the scenery, take photos, browse the Internet or simply relax, listen to the narrated tour and take it all in as you cruise in air conditioned bliss free of the responsibilities of driving. The reward at the end is a fun afternoon in Key West, where you will arrive rested and ready to enjoy whatever activities you desire free of any stress or worries about transportation back to Miami. Forget the stress of driving, and parking! A coach tour is the perfect choice whether you are looking for a quick day trip, want to stay in Key West for a few days, or simply need efficient one-way transport to the island. At about 4 hours each way, with hotel pick-up and drop-off included, travel by coach compares very favorably with the time it takes to make your way out to Miami International Airport, clear security, and deal with the other hassles associated with flying to Key West. And besides the great sightseeing, a bus ride is just much more fun in general. You will enjoy spacious seating, onboard Wi-Fi, snacking and resting at your leisure, chatting with friends, meeting new people, and learning a lot about the history and culture of the Keys. On our one-day round trip tours, you will have about 6 hours to enjoy Key West as you wish. You can tour historic landmarks such as the Southernmost Point, Mel Fisher’s Treasure Hunting Museum, Ernest Hemingway’s House, Fort Zachary Taylor, and more. Combine your bus tour with a water activity like snorkeling, parasailing, a jet ski tour, or a glass bottom boat ride. Or just enjoy some shopping and a leisurely lunch. Don’t be afraid to have a couple of icy cocktails – after all, you don’t have to drive! Why Miami To Key West Bus Tours? Arrive relaxed and ready for fun! We are a fully Licensed Seller of Travel by the State of Florida Dept. We run top of the line equipment with a 100% safety record. Our dedicated customer office is open 7:30am-11pm EST. Please call, email or live chat us your questions! Your data is encrypted and transmitted without risk using a Secure Sockets Layer (SSL) protocol. © 2019 Miami to Key West Bus Tour, all rights reserved. Fla. Seller of Travel Ref. No. ST39306.